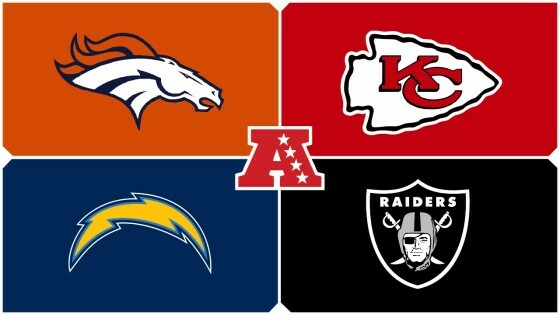 Tag Archive | "2017 AFC West"
The Raiders will look to take the next step and be serious title contenders this season, and hopefully, a late season injury to Derek Carr will not derail that. Carr has the weapons he needs in Amari Cooper and Michael Crabtree at receiver and those two should put up big numbers this season. Marshawn Lynch comes out of retirement at 31 to play running back, and while he hasn’t been taking hits of late, I wonder what he can do at this age replacing Latavius Murray. The line is very good with Rodney Hudson at center and Kelechi Osemele at guard. Khalil Mack leads the defense, of course, and should be in consideration for Defensive Player of the Year honors. Bruce Irvin is also a very good pass rusher and look for both players to free up Mario Edwards in what could be Edwards’ breakout season. First round pick Gareon Conley could be very good at corner and second year man Karl Joseph should emerge and help veteran Reggie Nelson at safety. Raiders should be playing the Patriots in the AFC Championship game this season. I have always felt Alex Smith is a better player than he gets credit for, and he better show it this season because the Chiefs have Patrick Mahomes waiting in the wings. If Smith struggles don’t be surprised if Andy Reid pulls the trigger and goes to Mahomes. Jamaal Charles is gone as running back so there is a question if Charcandrick West and Spencer Ware can pick up the slack in that department. Tight end Travis Kelce is Alex Smith’s favorite target and look for him to put up big numbers again this season. The defense is ignited by the play of Marcus Peters at cornerback. Peters is a ball hawk who has a knack for turnovers and turning them into sixes the other way. I expect Peters to make his claim as the best defensive player in the league this year and fuel that defense to carry the offense and thus carry the Chiefs into the playoffs. Trevor Siemian will start the season as quarterback but who knows how long that will last. Indications are, however, that Paxton Lynch has not progressed the way the team would have hoped either (Colin Kaepernick anyone). The Broncos have good receivers in Emmanuel Sanders and Demaryius Thomas too, which makes the lack of a quality quarterback even more frustrating. The defense has plenty of course with Von Miller leading the way. Look for Shane Ray to find his footing and really benefit from the attention paid to Von Miller in the pass rush this year. Aqib Talib is still one of the more solid corners in this league and Chris Harris Jr. is an excellent slot cover corner in the nickel package. If Denver got more out of its quarterback, they would be a dangerous team, but there isn’t enough there for a playoff run. The move to L.A. will not do much to change the losing fortunes of the Chargers for this season. Phillip Rivers can still play but he is simply wasting the few years he has left for a team that doesn’t seem to be going anywhere. Antonio Gates still has his moments but they are less and less frequent at this stage of his career. Melvin Gordon did improve on his subpar rookie campaign last season but was still less than four yards per carry. He needs to step up this year, not just for this team but for his future as well. Joey Bosa is going to be a very good pass rusher in this league and look for big things from him now in his second season. The loss of Manti Te’o will hurt this defense especially in the run game. Journeyman Casey Hayward, being one of this team’s starters at corner, should speak to the state of affairs in this secondary and that isn’t a positive.